With the start of the school year, Grace welcomed a new kitchen staff with the company Cater to You. They have gotten rave reviews from the teachers and students in all grades. The food is meant to be different–bold yet simple. The goal of the new chef is to open student’s minds to trying something new every day. 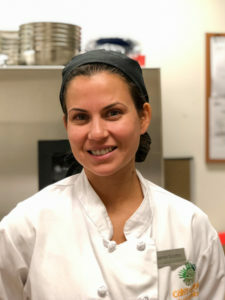 Jazmine Scotto is the chef manager. She is in charge of all the food, the management of the employees and making sure the products and food in the school are of high quality. She has known she wanted to cook as a career since she was very young. She got a degree at Cordon Bleu school and a culinary management degree in New York. Jazmine works successfully and closely with her team. “My sous chef is the main cook, named Luis Gonzales. We also have Nicole in charge of the composed salads and who also preps for Luis to get ready. We have Ali; he is maintaining the sanitary aspects.” Jazmine is from Paraguay and grew up cooking with her parents. “I always have a passion with my food, everything is fresh. Right now my favorite thing to eat is meatballs, and really enjoy a nice plate with a lot of sauce.” Her hobby is working out and her favorite thing to do in her off time is to spend time with her children, a 6-year-old and a 1-year-old. 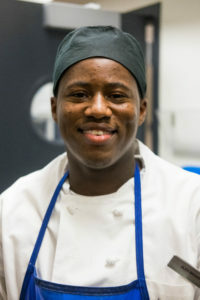 Another valuable member of the kitchen staff is Alex Brown, our dishwasher. Being the only member of the kitchen staff who has been working at Grace for a few years, Alex has created a lot of long-lasting and close relationships with the students and teachers. He is also an avid sports fan and prefers New York teams. In his new positions as part of the GCS staff, he actually fills many roles. He says everyone in the kitchen has a good attitude and works well together. “We all have to come together and move accordingly in order to make sure everything gets put out on time. If that means I have to cut cheese, although that’s not my job, I will do it. We definitely look out for each other and help each other when we need too.” He says he feels welcome in the community. It seems that the students at GCS feel the same sense of welcoming, as they appreciate the flavors and good taste of the new food that he helps to serve. Students have a fresh variety of food all the time but are not served anything too out of the ordinary. Although the Grace student body and faculty were originally hesitant with the shift in kitchen staff, they seem to be a good addition to our community.